Back in the 1970’s we lived and worked in the Warrumbungle National Park. Our house was situated at the western end of the park at the foot of Chalker’s Mountain. One day during our first spring we went for walk along a wooded ridge, north of the house. At the top of the ridge we found ourselves shoulder deep in masses of a mint bush in full flower. This is one of our enduring memories of our time in the Warrumbungles. The fact that we nearly tripped over a sleeping feral pig, at the same time, is another story. Subsequent investigation identified the Mint Bush as Prostanthera nivea var. induta a species that appears to be confined to the Warrumbungles with perhaps some populations in the Pilliga Scrub. After leaving the Warrumbungles, we lost touch with this splendid plant but after moving to Armidale found that an APS member had a specimen in his garden. A kind donation of cuttings means that there are places where we are again shoulder deep in Prostanthera nivea var. induta this time in our garden west of Armidale. 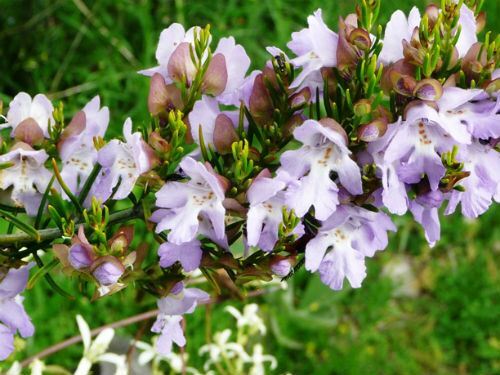 Prostanthera nivea var. induta is a medium shrub that reaches a height of about two metres in our garden. Linear leaves are one centimetre long, grey-green and held in small clusters. Unlike most Prostantheras “induta” has little or no foliage aroma. In our garden, during dry spells, many Prostantheras tend to wilt. This variety has proved to be wilt-resistant. The eye-catching, conspicuous and profuse flowers are mauve and one centimetre across. Blooms begin to appear in spring and are carried into summer. Of all the mint bushes that we grow this variety has the longest flowering period. Pruning is appreciated and this will keep plants from becoming straggly. We feel that Prostanthera nivea var. induta is different enough, from the other variety, Prostanthera var. nivea, to be given species status. In fact their only similarity is that they are both Prostantheras. Even back in 1978 the late George Althofer maintained, in his beautiful book The Cradle of Incense, that var. induta was worthy of species status. Another virtue, of this variety, is that propagation from cuttings is rapid. The type specimen was collected by Charles Moore (an early director of the Royal Botanic Gardens, Sydney) along the Castlereagh River prior to 1870. The variety name, induta means covered or clothed and refers to the white hairs that cover the stems.